Popularly known as paalak, spinach is a non-starchy vegetable provides a delicate texture and jade green color packed with loads of nutritional benefits. The glycemic index of spinach is around 15 which falls under low GI category. Due to exceptionally low carbohydrate content (1½ cup of spinach provides around 2.9 g of CHO), the glycemic load of 1½ cup of spinach is 1. Is Spinach safe for Diabetics? With exceptionally low carbohydrate content, spinach is considered as one of the super food for diabetics. Due to low CHO content, the glycemic load of 1½ cup of spinach is just 1. This makes spinach a very safe option for consumption. Limiting the amount of carbohydrate intake per meal to manage your blood sugar levels is important. Around 45 to 60 grams of carbohydrate is advisable per meal depending on your blood glucose levels. 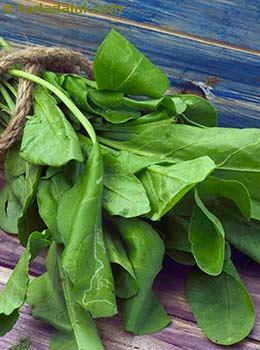 The fiber content in spinach also helps in maintaining your blood sugar levels. You can include spinach in your paratha, tikkis, sabji and make it more nutritious. Try making spinach juice combined with other vegetables low in calories such as tomato, cucumber or mix fresh spinach in salads. Is Spinach suitable for Weight Loss? To reduce your overall calorie intake for a healthy weight loss, you need to replace your high calorie food with the lower ones. Burning more calories than you consume will make a lot of difference. 1½ cup of spinach contains only 26 calories which is remarkably low and perfect for weight loss. You can easily include the fresh green colored spinach in place of calories loaded with saturated fats and simple sugars. Thus aids in your weight loss goals. Also spinach is a good source of fiber which will make you feel full for a longer period of time. Thus contributes in lowering your total calorie intake.